Hey, Ashley and Stephen! I'm getting ready to try your vegan challah recipe, and I guess before I start, I have a question: Do I need to use the two different flours you have in the recipe, or could I use all regular bread flour? I'm confused about all the different kinds and what they are used for. Thanks!" Great question, Justine! We're definitely not experts, but through our baking adventures, we've become familiar with various types of flours and their "best" uses. We've come up with this quick guide to help you distinguish between the 5 kinds we use most often in our recipes . . . Wheat Pastry Flour is likely familiar to you all. We make a lot of cookies, cakes, brownies, and other dessert-y (and breakfast-y) items . . . and in most of those recipes we either totally or partially use the stuff. Wheat pastry flour is just a light form of whole wheat flour made -- here's that word again -- lighter for fluffier results. I like using wheat pastry flour instead of regular pastry (or white) flour because it add nutrition to baked goods. A slight heartiness, along with fiber, vitamins and minerals and other heart-healthy goodness. Wheat Flour is something we mostly use when baking bread. If we want to add all that goodness we listed above (instead of simple bulk that white bread flour provides), we mix in some wheat flour with unbleached bread flour. It adds extra texture, weight, and protein as well. Again, our use of this type is mostly for health reasons. Bread Flour is great for yeasted baked goods (like breads and pizza crusts, etc. ), and though we very much like the health benefits of wheat (and even whole wheat bread flour), there's just something about the white stuff that has us coming back again and again. Bread flour has a high gluten content, which is essential to the bread baking process. 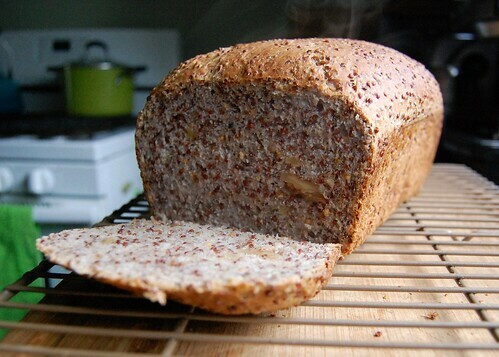 Even if you're making a "wheat" bread a little unbleached will do your recipe some good -- it allows the yeast to rise to its highest. All-Purpose Flour is really just as the name suggests: it's for all purposes. It's a good type to have around in a pinch because you can use it for cookies, breads, and -- again -- pretty much anything if you need to (think thickening agent in sauces, soups, etc.). It's made from a blend of both high- and low-gluten flours . . . so if you use it to make, say, bread -- be prepared, because it won't necessarily be prize-winning (you're using a more general ingredient than a specific one, if that makes sense). Coconut Flour is something we use on occasion, mostly in cookies and other baked goods. Though we've also used it to thicken soups. It's gluten-free, which is attractive to those of you who have restricted diets, and is full of dietary fiber. We're trying to learn about using gluten-free flours in baking -- so if you're at all interested in guest posting on this topic, we'd like to find out more (just email us). Bleached versus unbleached? Unbleached flour is not treated with any color changers (i.e. BAD stuff like peroxides, dioxides, and chlorine). It is more a cream color than bright white. 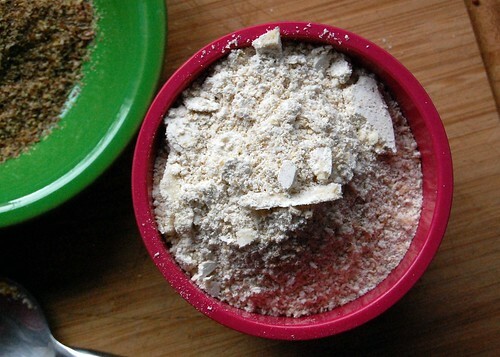 Bleached flour has been treated with the "BAD stuff" and is as white as it can be. After the bleaching is done, it's also missing some of the nutrition it had in its original state. I could be wrong, but I think the primary reason flour is bleached is for aesthetics. We stick with unbleached whenever possible. Our favorite flour brands are Bob's Red Mill (for Wheat Pastry and Coconut) and King Arthur (for everything else). What do we have on hand right now? A full bag of all-purpose flour, a small bag (half-used) of wheat pastry, an unopened bag of wheat flour, and 3/4 a full bag of unbleached bread flour. We're constantly using different kinds -- so it's key to keep ourselves well stocked. Plus, it's way healthier and more satisfying to bake up bread at the beginning of the week than purchase boring store-bought varieties. 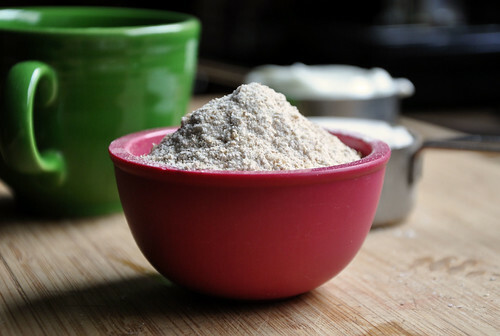 What kind of flour do you use most often in the kitchen? We'd love to know if there are any regulars on your shelves that we may no have covered above (like spelt, rye, etc.). Just leave a comment or email us at neverhomemaker [at] gmail [dot] com.